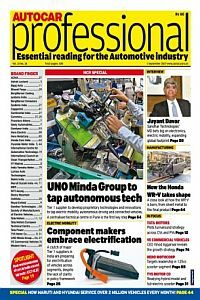 Autocar Professional is a twice-monthly B2B publication targeted at the Indian automotive industry. It’s delivered to key executives and decision-makers, and provides in-depth analysis of this booming market through its concise news, incisive interviews and accurate data. It also gives the latest information on the automotive markets of China, Taiwan, Indonesia, Malaysia and Thailand. Autocar Professional also publishes an annual Directory, a comprehensive guide to almost 2000 products and companies.